Due to iPhone X outstanding design and other sleek features, the phone is premiumly priced. Therefore, buying an iPhone X is a significant investment. With its high price tag, repairing this phone would also cost you a fortune. However, buying a protective case is exceptionally cheap than replacing any part of the smartphone. Getting protective case for iPhone X is highly recommended. Everyone has their own preference when it comes to buying phone cases. Some prefer to have designer phone cases, and some purchase cases with some specific purpose like-Wallet case. There are a lot of options out there, so we’ve decided to put together a roundup of what we believe are the best wallet cases for the iPhone X. We have picks for every budget and design preference, including thinner, minimal plastic wallet cases and larger, more premium leather cases. 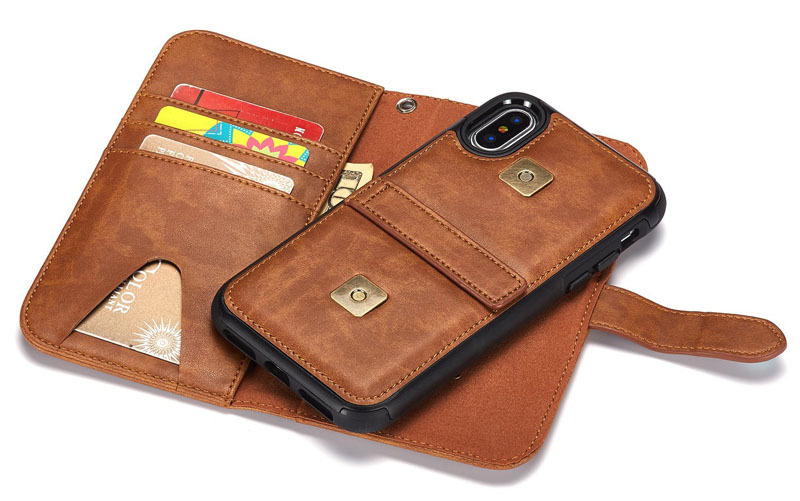 Caseme presents this best iphone card case, You can keep almost all your regular wallet stuff inside this leather wallet iPhone X cases. It looks great as well. If you don’t need a wallet, then you can quickly remove the wallet from your iPhone case. This is one of the best wallet case for iPhone X. 2 in 1 detachable design. It can store up to 10 credit cards including 2 ID card slot, 3 Pocket for Cash and 1 Zipper pocket for coins. Phone can be detached from the wallet, and you can stick your phone to any metal because of magnetically attached phone back case. One of the good things about this phone case is, it supports Wireless Charging in iPhone X. All you need to do is, you just need to detach the inner Phone case and keep it on the wireless charger pad of iPhone X. Carrying your phone without a protective wallet is risky as it exposes it to damage in case of an accidental drop. The construction of this wallet gives it outstanding performance since it not only protects your phone but credit cards. The materials used are great in blocking the RFID technology that is used to steal chip technology data from a distance. The PU leather used is sleek and dedicated to ensuring that the case is fashionable besides providing ample protection. Fitted with a cosmetic mirror, this wallet gives you a chance of keeping your face make up intact. Furthermore, the kickstand function is great when you want to experience hands-free watching. 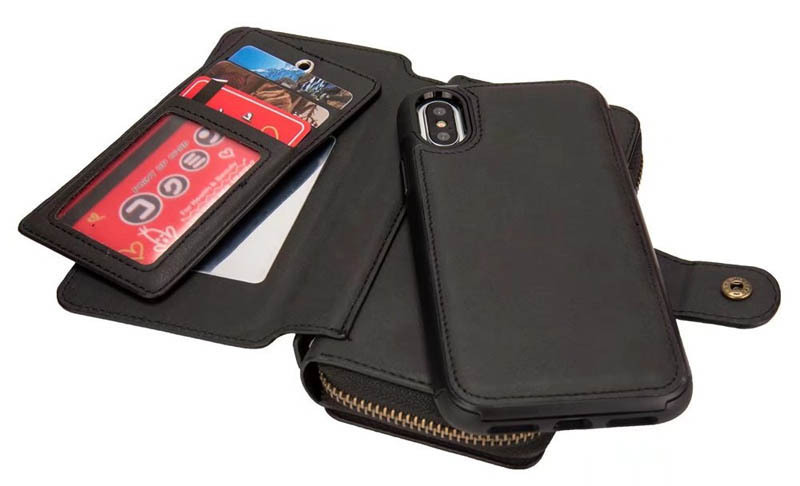 Within the best wallet cases, this merchandise of Caseme carves its own niche, preeminently for the machine made exact contours that allows operating the totality of phone functions with topmost ease. 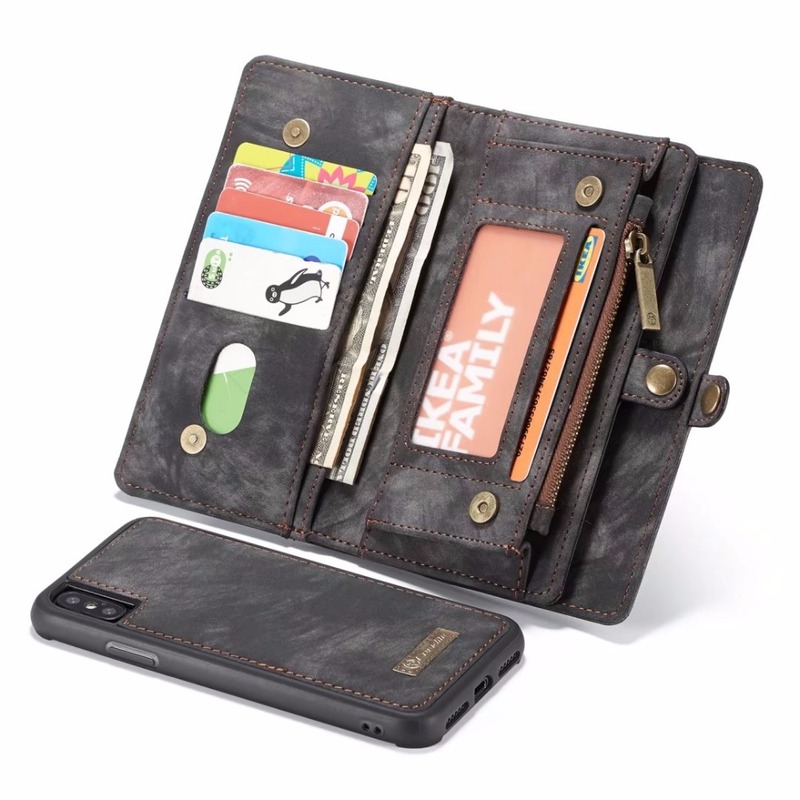 Shaped from up-scale standard matte cowhide element of PU quality, the product possesses 14 card chambers and an ID card purpose window slot. The inside zip-close cash section and those features of anti-skidding and shock-absorbing augments the item’s popularity amidst best wallet cases. The phone compartment (for iPhone X) is a sturdy ‘Magnetic’ grade one and can be separated for single-style usage. 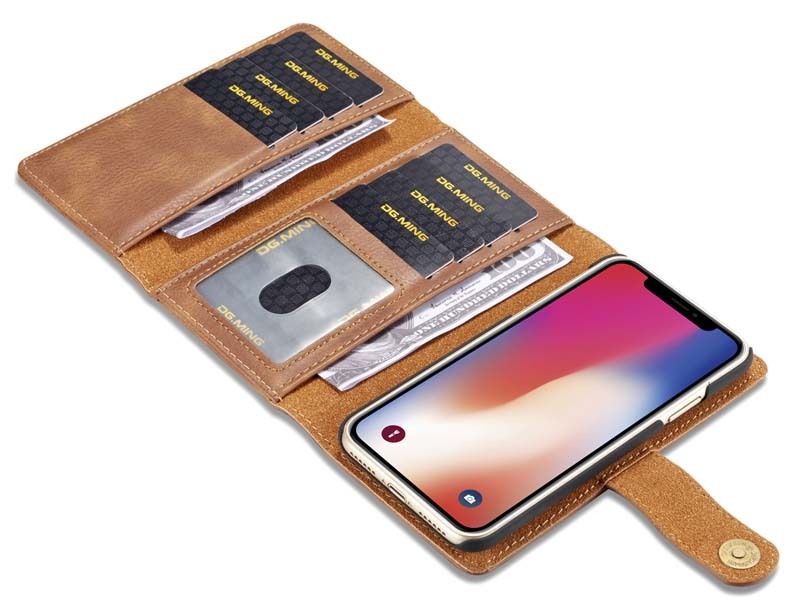 For a perfect protection, your iPhone X needs a customized wallet case to provide excellent protection. 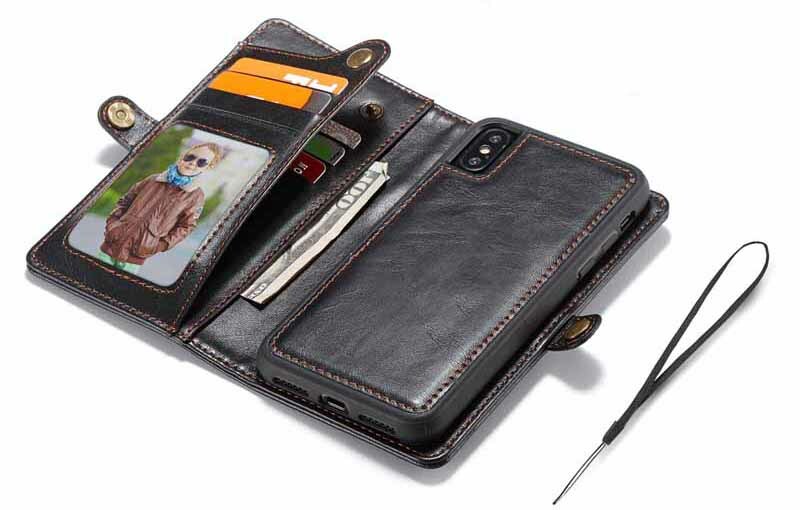 The BRG leather case is specifically designed iPhone X. unlike other wallet cases; this one is safe and eco-friendly. Furthermore, with magnetic closure, it is easy to close after using the phone. Apart from protecting the phone, the wallet features 5 card slots, 1 cash pockets, 1 zipper pocket that enable safe and easy card storage. The precise cutouts leave camera and sensors uncovered for improved convenience. Also, the slim detachable case is great for ensuring that you can use it separately without the phone. DG.MING Case always takes your smartphone’s security with a lot of concerns. That is why they deliver great products to improve the safety of your devices. Now, this foldable cover case is among the best iPhone X wallet cases that are superior and hardy to keep your phone safe. The designing is impressive since it has sleek synthetic leather that keeps the phone safe. 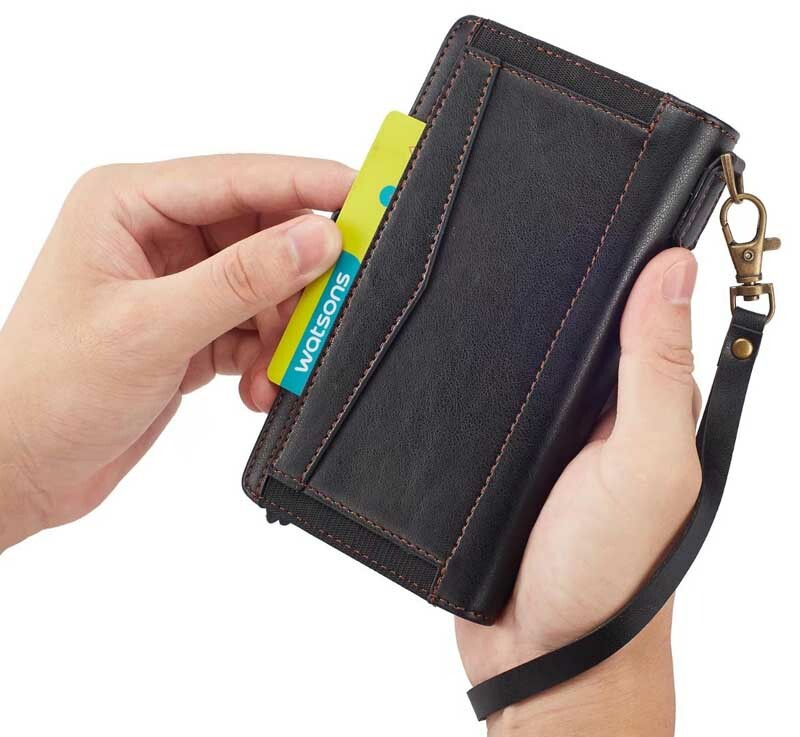 For easy closure, the case boasts magnetic strap that keeps the wallet closed throughout when the phone isn’t in use. Whether calling, receiving a call or taking photos, there is no need to remove the cover since it has precise cutouts. With cover converting into a kickstand, it is easy to watch movies when relaxing. If you are looking for the best iPhone X leather wallet case, then this slim and durable BRG Case is the ideal cover for your Apple X iPhone device. The lightweight model has a chic and classic design that will look good whether you attend a formal or casual occasion. Besides, there are different shades to match your clothing or your favorite color. The case lets you travel lighter without carrying an extra wallet or purse because it can hold an ID and up to four credit cards. You also have a pocket to keep your bills and cash. The case has precise cutouts so you can access all ports and the strong magnetic closure provides security to all your important items. The rugged PU leather will resist scratches, and it will not fade over time. You will love the vintage-style design of this wallet case. The black flip wallet case cover for iPhone X comes with a gift box package so you can surprise your loved one on a special occasion. It is designed with premium vegan leather that is highly durable and will stand up any occasion. The 2 in 1 case has a detachable magnetic back cover and PC plus TPU inner case. There are multiple cash and card slots on this beautiful cover where you put your credit cards, ID, and money. It also lets you access all buttons and ports without any hassle. 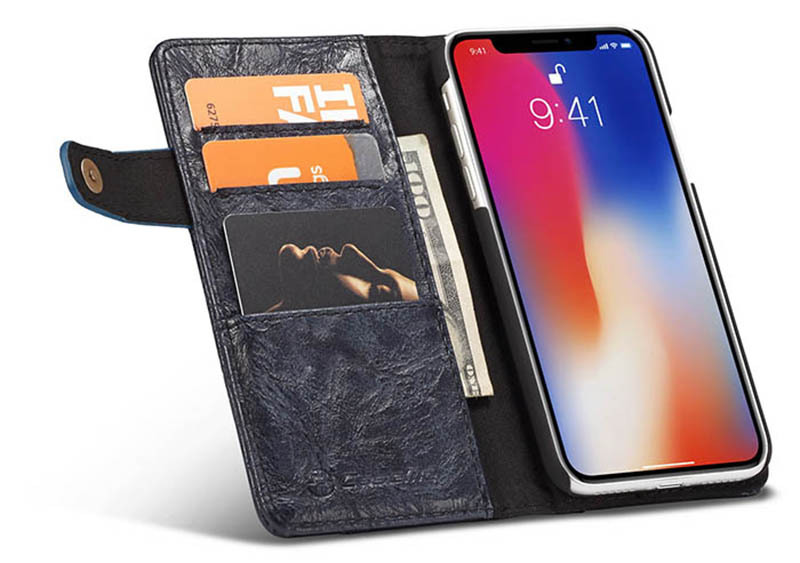 This iPhone X wallet case has a slim design to add minimal bulk while still retaining your phone’s stylish look. 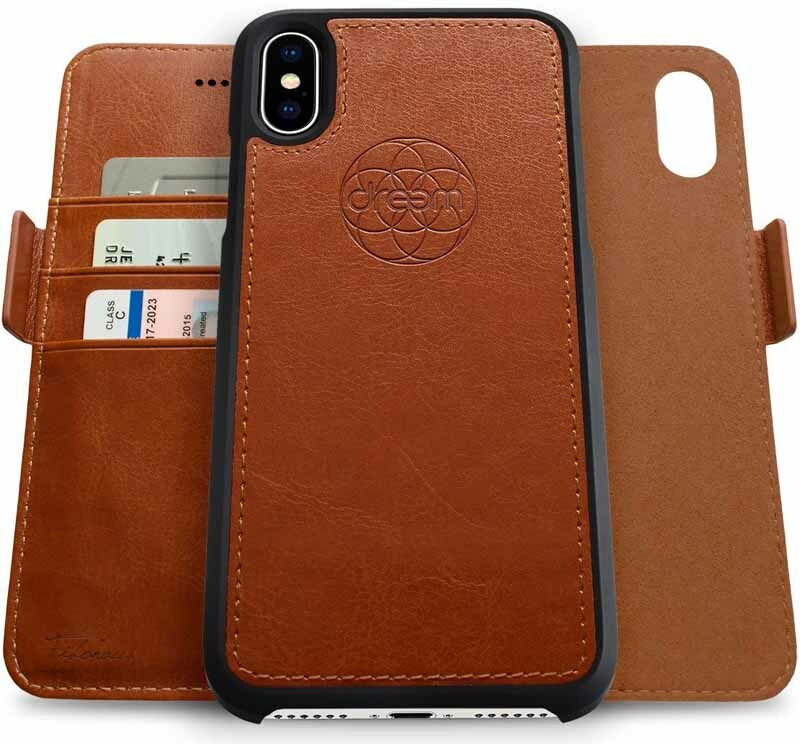 The Caseme latest release is a simple yet highly functional wallet case that keeps your iPhone X safe and eliminates the need to bring along an extra wallet or purse. It is made of durable genuine leather that gives it a soft nature and chic design. The case supports wireless charging and works well with magnetic car mounts. Its detachable design allows you to change it from a wallet case to an ultra-thin phone case without any hassle. 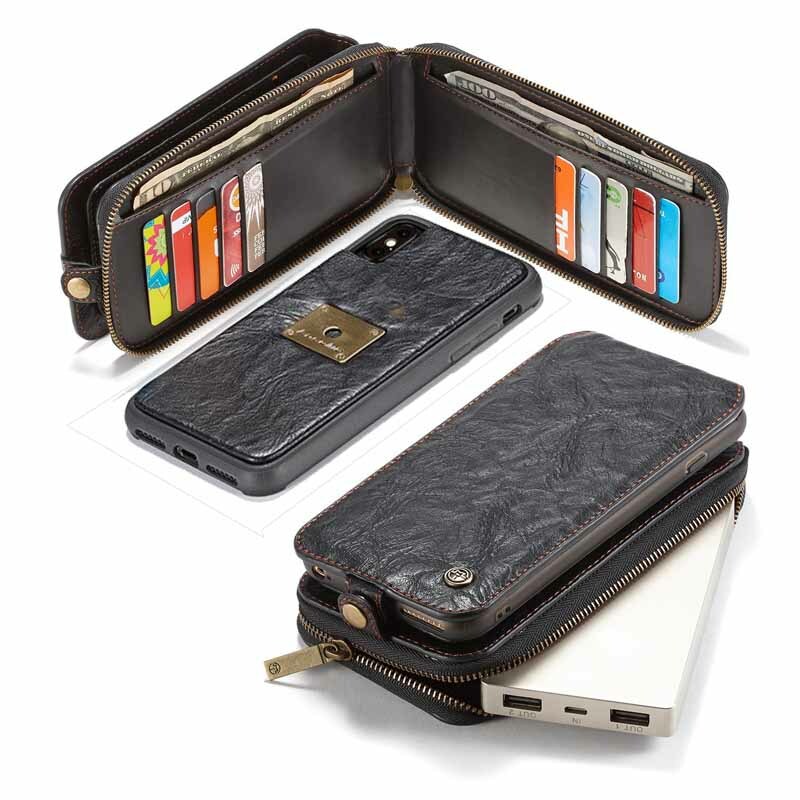 The Dreem brand brings this distinguished iphone case wallet, which comprises RFID grade protection system in each of the 3 storage slots and is articulately hand made from premium quality vegan leather. The Dreem model comes in nine different shades so you can easily pick a model that matches your favorite color. It also comes with a gift so you can give it to your loved one on any special occasion. The high-quality faux leather with reinforced stitching will complement your iPhone form and function. It fortifies its position amongst best iphone wallet cases for the exquisite ‘Slim Case’ that is molded with the purse sections by a magnetic mechanism. The case can be separated on requirement is adeptly secured against accidental drops. The iphone case wallet gets locked up through a ‘Safe Mag’ technology, which clasps and bolts the purse by an auto mode. 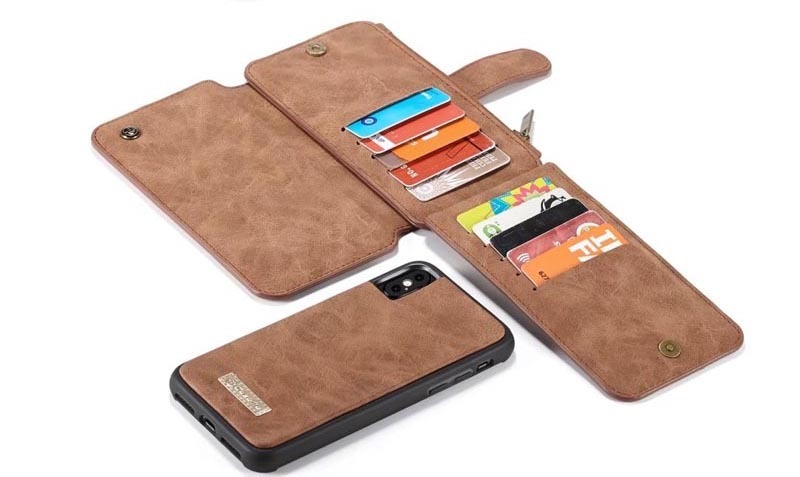 A matchless one within best iphone wallet cases, the merchandise also possesses one kickstand that can be angle-customized both horizontally and vertically. Forget about the cheap plastic phone cases that last for a few days, and they get damaged. The Caseme premium PU leather wallet is an absolute choice that every iPhone X owner should have. The Folio book design adds elegance since it boasts 3 slots to enable storage of credits cards and ID cards. The wallet is slim to provide ease of carrying. The flaps don’t move around since the case features magnetic closure that also boosts the screen protection. Precise cutouts leave vital features such as camera speaker and charging ports easy to access without removing the wallet.